We would like to count on your presence as well as people you may know interested in our activities. 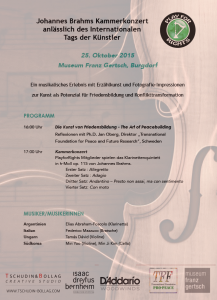 PlayforRights organizes this event (see poster below) to raise awareness and consciousness about the following statement: “The arts contribute to the field of human rights by making visible the human dimension”. Why do we do this in a celebrative way? 25th of October can be seen as any other ordinary day but for members of PlayforRights it is not. This date is very important moment of the year where we all, the civil society, shall meet together and raise awareness about the potential of the art expressions within processes of social change. For this, we need to recognise that the arts are ways of nurturing love, that art is a creative element to build peace and strengthen human rights in every corner of the world. It’s International Artist Day – right after UN Day on October 24. 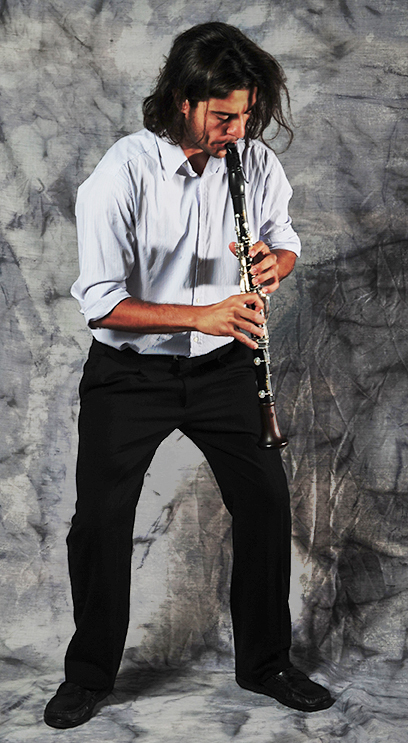 Brahms Clarinet Quintet – listen to it here and read about it here – is not any other ordinary piece of classical music. Indeed Brahms, one of the greatest composers, was a person who in a certain way suffered through life in search of his inner being. He was a meticulous person constantly pushing his own limits in order to find inner peace. Toward the end of his life, Brahms decided to restart composing especially for this wonderful clarinet quintet; a quintet which is about embracing humanity; a music that serves as a metaphoric way to understand repetition and circularity all conflict work; a piece of music which fully embraces the human dimension. Along this piece its contrapunct texture becomes one voice; so to speak five elements or instruments that after trauma, suffer and pain find each other in a communal peace. Without doubts the power of this music goes far beyond the notes. With this, Brahms offers with sounds what PlayforRights affirms with words: “Right there, where all possible communication skills among humans fail; the power of the art arises’. 4. Art-based approaches in peacebuilding. 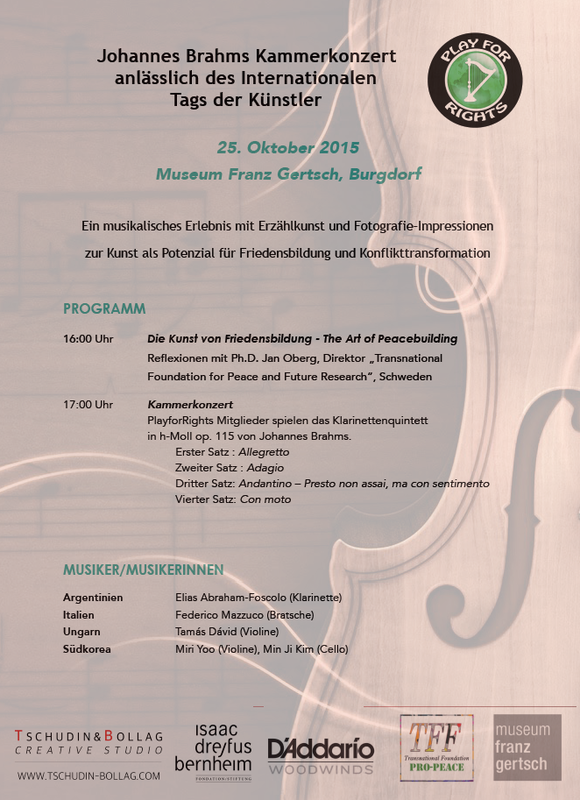 We look very much forward to see you in the audience in the beautiful Museum Franz Gertsch in Burgdorf this coming Sunday.